We really did stress over making the Mii characters work this time, but aside from that, when we thought about this game being in the Wii series, we thought if we just put in board games and minigames using Mii characters, something would be missing. By “Wii series” you mean games like Wii Fit 8 and Wii Sports 9 that start with the word Wii. 8Wii Fit: A fun and fitness software released for the Wii console in April 2008 in Europe. It came bundled with the Wii Balance Board. (It’s currently available as Wii Fit Plus, with additional features) 9Wii Sports: A sports game released simultaneously with the Wii console in December 2006 in Europe. It includes the games Tennis, Baseball, Bowling, Golf and Boxing. Yes. So in order to release it as one of the Wii series, we had to face a new challenge. 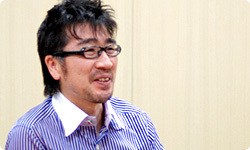 Up until now, Nintendo has made all the Wii series games with in-house teams, and Miyamoto-san produced them all. 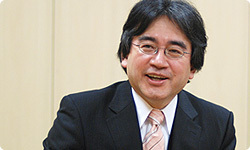 In other words, the Wii series is a group of prominent Nintendo titles designed for the Wii hardware that anyone can play regardless of age, gender or gaming experience. About one year ago, we hadn’t formally decided on a title yet. 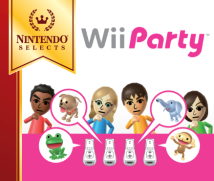 If we had failed at that new challenge, it might have been released as Mii Party, rather than Wii Party in the Wii series. That’s right. You were told that if it didn’t live up to the name of the Wii series, we couldn’t give it the name Wii Party. So you had quite a challenge to overcome. Yes. We had to give it plenty of energy and time in order to earn the name Wii Party. What did you do toward that end? A house party? A birthday party? The more we thought about the various kinds of parties, the more we got bogged down. We really worried over it. Around the summer of 2009. According to our usual schedule, it was about the time we would have needed to start polishing it off. At first, we had tentatively been calling Mario Party for the Nintendo 64 by the name of Mario Board. In the end, we released it as Mario Party. Just like the name indicates, it consists of minigames playable on board games. So rather than party games, you had board games in mind. That’s right. That was our original departure point, so we were focused on playing board games and minigames on the television screen. But we thought once again about what a party is, and as a result, we realised parties are about having a good time together with other people. We decided to put in whatever we could think of to a level surpassing any other product in the world, and the very last thing we thought of was play using the Wii Remote. We thought about removing the strap from the Wii Remote and using it that way. We wondered about, rather than playing on the TV screen, playing on this side of the screen, using the room itself as a play space. One of our staff members is the type who doesn’t usually talk about the contents of a game, but one day he quietly said, “What if we hid the Wii Remote?” and that one sentence suddenly broadened the horizons of our ideas. You normally assume that the Wii Remote is for operating a game. The suggestion to hide the remote brought about a sea change in inspiration. Yes. When we came up with that idea, it just so happened that most of the main staff members were present, and suddenly everyone came to life. The first minigame we thought of was Hide ‘n’ Hunt, a hide and seek game using the Wii Remote. But if you simply hid the Wii Remote somewhere in the room, it could be pretty hard to find. We thought a hint was necessary, and decided to have the remote’s speaker make a sound. We tried out a sound, and that sound itself was funny. The next idea was Animal Tracker. We tried having the remote make an animal sound. You had to guess which remote was making the sound, and that was really fun. So the first idea set off a chain reaction of other ideas. Another House Party game is Time Bomb, where you pass the Wii Remote around. Games in which you pass around bombs are fairly commonplace, but the Wii Remote has an accelerometer, so it can tell when it’s tilted. We thought it would be fun if we set it to explode when it tilts, and that’s how that game came about. But when we tried making it, everyone passed the remote around so carefully that the bomb never exploded! (laughs) So we made it so there’s a time limit to rush the players and they have to press buttons displayed on the screen. Then we displayed the vibrations on the screen as a graph, making it really easy to see how steady you are, and suddenly it became really fun. Up until now, using the controller in a rough manner has been the norm for party games, but the addition of House Party games is fun for a change of tempo because of the contrast between moving and sitting still. The television and area in front of the television aren’t the only play spaces as has always been the case. The whole room becomes the play space, so I too sensed a new challenge there. Thank you. But there was one other big hurdle. Since it was going to be released in the Wii series, we decided to have the development teams for Wii Sports Resort10 and Wii Fit Plus11 try it out and tell us, openly, what they thought. 10Wii Sports Resort: A sports game released in July 2009 in Europe for the Wii console. The game is compatible with Wii MotionPlus. 11Wii Fit Plus: A fun and fitness software released in October 2009 for the Wii console. It consists of an enhanced version of the original Wii Fit disc and has a number of additional features. Our readers probably have no idea what kind of corrections we’re talking about, so could you give us an example of the kind of thing they pointed out? Exactly. That’s just one example, but there were problems with tempo all over the place. The Wii Sports Resort team didn’t pull any punches in pointing them all out. When it comes to pacing, the Wii Sports Resort team may be the most sensitive group of individuals at Nintendo. Since you were bringing out your game as part of the Wii series, they gave it a thorough check and told you what should be fixed. Yeah. We were grateful for that.